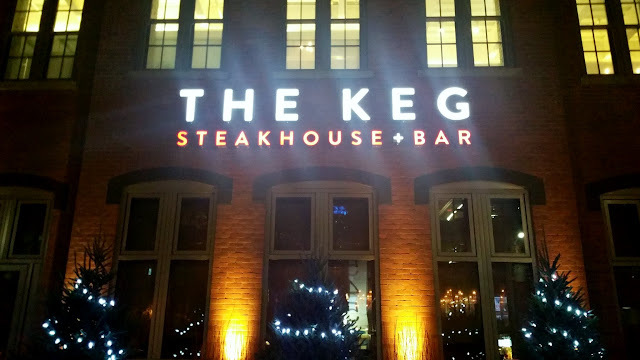 Contrary to what some of you may think I actually really like The Keg. I go there whenever I feel like having a tasty piece of steak. I go with friends and family for casual dinners and for special occasions. The thing I like the most about the steakhouse is that it is very consistent - it doesn't matter which location I go to I know I'll be served their warm house-made sourdough to start, that their French onion soup will be just as cheesy as the bowl I had last time, and that their twice-baked potato will always be my favourite side. I also know that with my steak I would be sipping on a decently-priced glass of wine in a nice, comfortable dining room, and I would leave content and full all without putting a big dent in my wallet. Don't get me wrong, I'm all for supporting independent restaurants but truth be told, there's nothing that can replace The Keg in my mind. Anyway, you know how I mentioned I like having wine with my steak? Like most people? ;) Yea, although I love cocktails I always stick to wines at The Keg, this is because I've tried a few of their cocktails on several different occasions and they were all less than stellar. They were either too sweet, not boozy enough, or both. So, when The Keg invited me to their new King West location (Twitter: @TheKeg, Facebook: The Keg Steakhouse + Bar) for a cocktail tasting I was game. I was really curious to see whether their cocktails have improved 'cause in my opinion, there was really nowhere to go but up. BOURBON MAPLE MARTINI (2oz, $11) - Woodford Reserve bourbon, maple syrup, fresh lemon and cranberry juice. GINGER DARK AND STORMY (2oz, $11.5) - Gosling’s Black Seal rum, ginger syrup and fresh lime juice, simple syrup and a splash of ginger ale. CRANBERRY MOJITO (2oz, $11.5) - Havana Club 3 Year Old rum, fresh lemon and lime juice, soda and muddled mint, cranberries and sugar. CRANBERRY SMASH (1oz, $7.5) - Woodford Reserve bourbon, Chambord, Jägermeister, cranberry juice and simple syrup, fresh lemon juice and muddled cranberries. KEG NEGRONI (3oz, $12) - Hendrick's gin, Aperol and sweet vermouth. HONEY VANILLA MANHATTAN (3oz, $12) - Jack Daniel’s whisky, Jack Daniel’s Tennessee Honey liqueur, red and white vermouth, Galliano and house-made drunken Bing cherries. 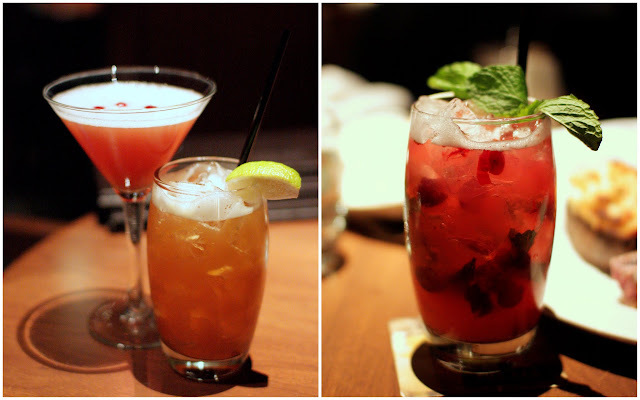 There's no question that The Keg has stepped up their cocktail game. 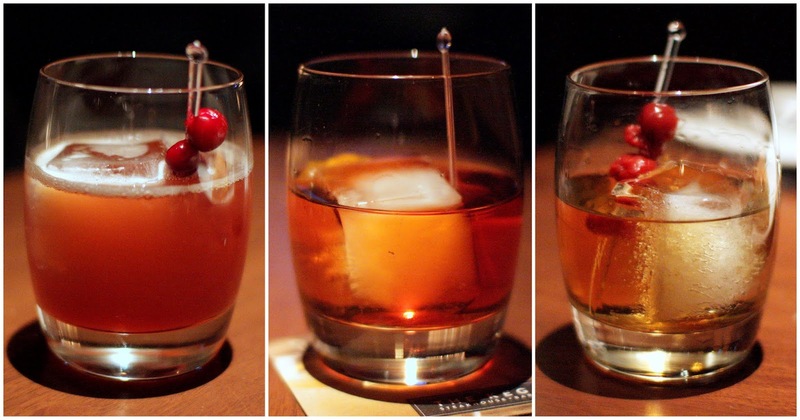 You can now find pretty trendy cocktails and martinis there. One of my favourites was their spicy twist on the Dark and Stormy (made with fresh ginger) and albeit a bit sweet, I also enjoyed their Bourbon Maple Martini and their Cranberry Smash (I'm a bourbon girl). Both the classic Negroni and Honey Vanilla Manhattan seemed a lot boozier than I remembered ... which is, of course, a very good thing. So. Much. Booze. NEED. FOOD! This was my first time having the tuna tartare at The Keg. Introduced in November 2014, the starter consists of well-seasoned ahi tuna cubes on a bed of smooth and creamy avocado served with crispy wonton chips. I always order the French onion soup at The Keg. I love it because the top is always melty and cheesy, and the broth is flavourful without being salty. Available until the end of December, the Kansas City Striploin is grilled and served bone-in. This cut is often referred to as “the best of both worlds” because it is very flavourful like a Sirloin but also still very tender like a Filet Mignon. I like to order my steaks blue so the filet mignon comes out super soft and tender every single time. Blue cheese 'cause I like blue cheese. I haven't met anybody who doesn't like the Billy Miner Pie. NO ONE. If you don't like it we can't be friends! The Billy Miner Pie is seriously so friggin' good it's like crack; Momofuku Milk Bar's Crack Pie has nothing on the BMP. If I can buy a whole Billy Miner Pie to take home, I will. I'll be 200 lbs but whatever. BMP in a boozy, liquid form.